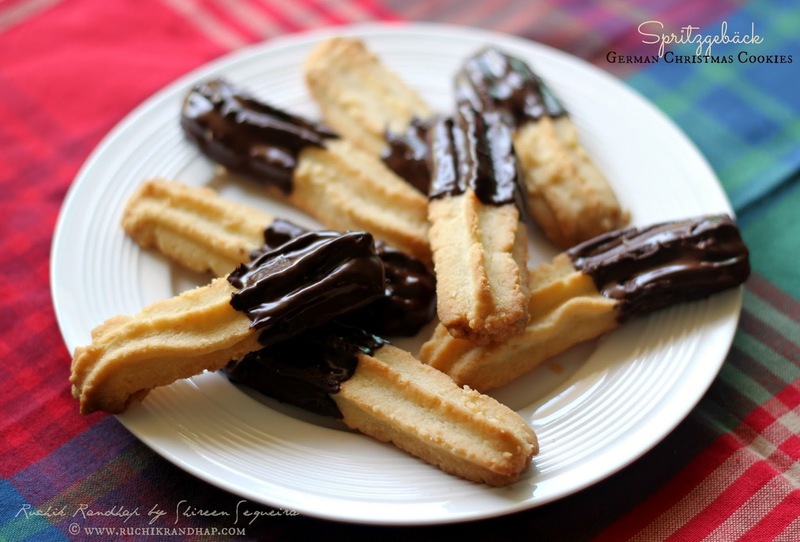 Spritzgebäck (pronounced as shplitz-ghe-beck) are one of the most delicious cookies that I’ve ever tasted! They are as Amul’s logo states ‘utterly, butterly, delicious’! Honestly, I never thought that making these would be so much fun and that the taste would win so many hearts. When I first came across this recipe I instantly bookmarked it to be tried out for my Christmas collection. I was so delighted when the results crossed my expectations in terms of taste. Initially I thought I had done a poor job at shaping them but I realised that I didn’t do so bad either. Spritz cookies derive their name from the German word ‘spritzen’ that means ‘to squirt’. The buttery soft dough is squirted (squeezed to push) out of a cookie press that has a metal plate with designs at the other end of it to help make pretty, fancy shapes. 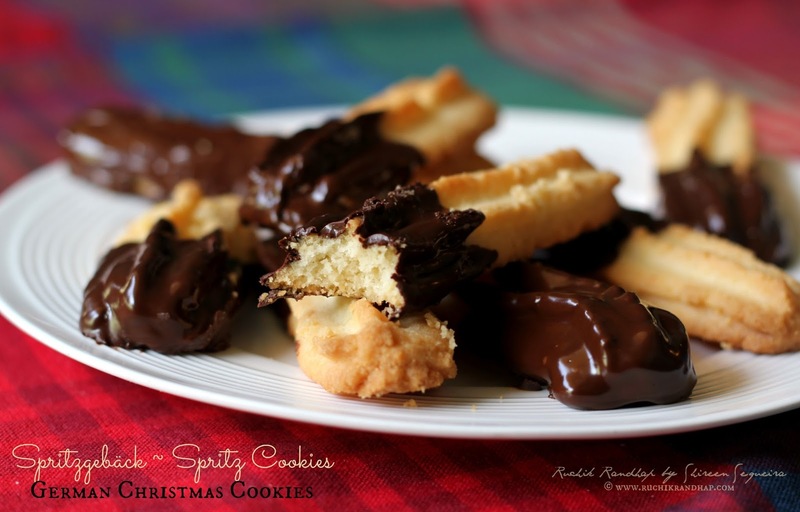 Spritz cookies are traditionally made during Christmas in most Scandinavian countries. While the most standard equipment for this cookie is the spritz cookie press which is a kind of a tube with a metal plate inserted on one end that helps get the exact shape and size of the cookie dough out, you can also pipe out the shapes using a simple piping bag attached with a star nozzle (which is what I did). After I had piped out all of the dough I realised that I had a spritz cookie press that the husband had bought for me a few years ago from his trip abroad and I had totally forgotten about it! I am going to use it in the next few days when I start my Christmas baking. These cookies are extremely fragile and melt in the mouth. Trust me, they will taste better than that store bought box of Danish cookies. Homemade cookies always score higher in comparison to their store bought counterparts – this is my opinion. I do hope you give these cookies a try. If you don’t have the star nozzle fret not! Just use a ziplock back, place your cookie dough in one corner, snip off the end and you are ready to go! 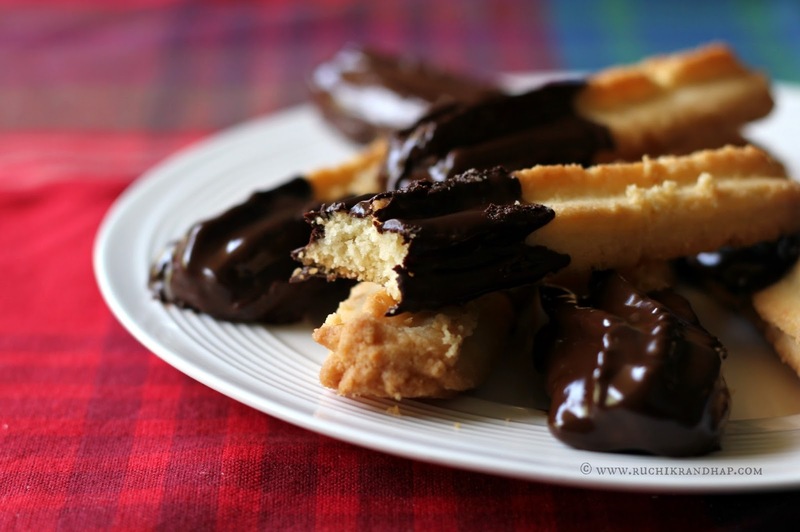 These melt-in-the-mouth German cookies are a must try this Christmas! Preheat oven to 180 C and line 2-3 large baking sheets with baking parchment. Keep aside. In a mixing bowl, place the butter and beat it with an electric whisk/hand mixer till fluffy. Add the sugar, vanilla and salt and mix till everything is well incorporated. Transfer the prepared mixture into the piping bag fitted with the star nozzle and pipe the mixture into 3 inch lengths onto the baking sheet. Bake for 12 minutes or till light golden. Remove and allow to cool for 5 mins on the baking sheets before transferring onto a wire rack/cooling rack till they firm up completely. 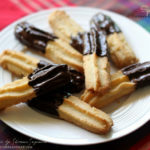 You can transfer them into an airtight container right away or glaze them with the melted chocolate, cool again till the chocolate hardens and then transfer into a box. 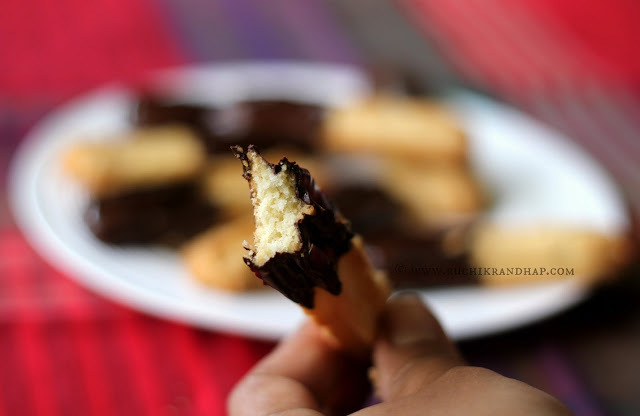 To glaze with the melted chocolate, melt the chocolate in a bowl placed over simmering water or in a microwave in 30 second intervals and dip the cookies halfway into the melted chocolate. Cool completely till the chocolate hardens and store in an airtight box. If you don't have a star nozzle just use a regular round shaped nozzle to squirt out the cookies. If you don't have a piping bag just place the cookie dough in one corner of a clean zip lock or food grade plastic bag and snip off the end with a pair of scissors. You can widen the size by cutting a bigger hole once you have piped out a cookie or two. 2. It is important that you get the right consistency of the dough. If it is too soft you won't be able to get proper shapes and if too dry, the dough will break while shaping and also result in dry, crumbly cookies. If the dough is too soft, chill it in the fridge for about 15 minutes so that the butter in the dough hardens up a bit. Loosen up the dough with the egg yolk if you find it too dry. 3. If you will be using the same cookie sheet (baking tray) between batches make sure they have been cooled down to room temperature or else while you pipe the cookie shapes onto them, the butter will begin to melt and the cookies will lose shape. Between batches, lightly rinse the baking sheets and wipe dry or chill them in the fridge before using them again. These came out so good Shireen! And the deliciousness wafted all through my 11 storey apartment block…they are the most delicious cookies I have ever baked! thanks! @ Sharon: I am so thrilled to hear this!! Thanks so much for the feedback! Yeah, they really are one of the best I've ever eaten and definitely the best I've made so far!